Terence participated in various competitions and exhibitions both local and overseas such as Australia, China, Hong Kong, Philippines, Taiwan and United Kingdom. He has recently participated in Art Stage Singapore 2015, Hong Kong Affordable Art Fair 2015, Singapore Affordable Art Fair from 2011 to 2015 and showcased his work at Forest Rain Gallery in 2010. 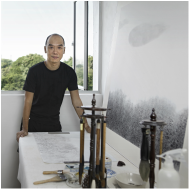 He held his first Contemporary Chinese Ink Solo Exhibition at the Utterly Art Exhibition Space in 2003. Terence's series of paintings is inspired by the urbanisation of the environment and the relationship between man and nature. His works have gained wide interest and collected by Singapore and foreign buyers.